" 'The aesthetic goes beyond every concept because it produces the intuition of another nature than the nature given to us,' Delueze writes. 'Thus invisible beings, the kingdom of the blessed, hell acquire a body; and love, death acquire a dimension to make them adequate to their spiritual sense.' "
Why practice magick? Because it works. Speaking now of the thaumaturgic variety, magick intended to change the environment intentionally. We use it only occasionally after all conventional material means fail to provide working solutions to the problem. In the case of Alphonse, our recalcitrant Soundcraft digital mixing board, all the stops and tricks had to be pulled out to get him to follow the program. I'll explain. I first met Alphonse September 10th in Edmonton, Alberta. I was in Edmonton to begin rehearsals for the Fall leg of the SIMRIT Songs of Resilience, Global Unity Tour. The first time I ever spoke to Simrit about touring with her band, she mentioned a problem with the stage sound: whenever the reverb was turned up in the house, it was also boosted in the stage monitors and obscuring the sound. Dynamic reverb rides are a key part of their mix making this a chronic problem. I thought that the previous sound engineer didn't know what they were doing and wasn't expecting to encounter a malfunctioning mixing board prone to mild acts of chaos. It was like silicon-based poltergeist phenomena where switches would randomly get turned off, or master faders turned down without the human operator's participation. That's how it ended up ... in the beginning, it was a real nightmare. After setting up in the rehearsal space it was discovered that whenever the reverb and delay returns were turned up in the main speakers, they also increased their volume in the stage monitors. The entire first day and night was spent working on this problem. The inability to use the FX dynamically would seriously cramp our style. I found a pdf of the Soundcraft Expression manual online and nearly sprained my brain spending hours trying to decipher and apply the manual's technical language and proprietary nomenclature. I viewed numerous YouTube tutorials, yet nothing addressed this problem. A message was left with Tech Support, but it was Sunday and no callback was expected. I delved deeply into the board's programming trying different things all to no avail. I was told by Tripp that this board had a colorful history of weirdness, unreliability and rogue programming by its first user. Legends were told of its nonfunctionality. It could always be made to work, but not without multiple issues. Russell, a veteran sound reinforcement engineer, had attempted to completely wipe out its programming - a move I was contemplating until hearing this story - to get back to the tabla rasa of the factory settings only to find that it stopped working with the stage box, the digital snake - the microphone inputs plugged into the stage box didn't make it to the board. In human nervous system terms, this compares with the heart and sense receptors being unable to communicate with the brain. Coincidentally, the heart being unable to communicate with the brain seems a prime feature of the current U.S. government. Spent that whole first day in the Chinese Hell of Technical Problems exhausting every material resource I could think of with no luck. As a last resort, I appealed to the appropriate Enochian Angel for help. No space for any kind of ritual, I just invoked using muscle memory and asked for help. Powered up the system the next day and discovered the FX monitors boost problem had vanished with absolutely no rational explanation. This particular issue never returned. Only now, the FX wouldn't feed the monitors at all. From way too much reverb to none at all. This recalled the old joke about a guy who goes to a psychoanalyst and tells the doctor that he's in love with his umbrella. One day, after 5 years of therapy he suddenly exclaims, "Doctor, doctor I'm cured ... now I HATE my umbrella!." Reverb in the monitors is a crucial element in SIMRIT's stage sound and affects how they perform. No reverb on stage was just as much a problem as too much reverb. I had a back-up plan involving an external foot pedal reverb, but somehow I was able to program one of the FX banks to send to the monitors, it worked just fine for the second rehearsal day. The reliable, effective functioning of this Soundcraft Expression mixer was crucial to our mission for several reasons, one of the primary ones being that it had a USB output that I could connect to a laptop and make multitrack recordings of the show with Pro Tools software. Due to the mixer's unpredictable, irrational behavior, I decided to treat it as if possessed by a goetic being, i. e. acknowledge its sentience as a mischievous, disobedient entity. You will find suggestions in Goetic literature to treat these kinds of entities like you would an erratic junior business partner or a disobedient child who has to be kept in line. The first order of business was to discover its name. The ancient Egyptians said that knowing a person's true name can give you power over it, the power of communication. Immediately upon forming this intention I silently heard the name, "Alphonse" so went with it. This name had no meaning or significance that I'm aware of. I liked its quasi-regal sound thinking this might flatter the entity's vanity. Stroking a daemon's ego seems an old technique for getting it to faithfully do your bidding. It would take a little time for Alphonse to get with the program. The first concert in Edmonton revealed more of it's strange behavior. Connecting a SMART phone for music to check the sound system resulted in it's signal going out multiple outputs along with the designated channels. Muting every channel didn't stop the music from going out the master output. Still a ghost in the machine. The problem was solved by using different Line inputs that functioned correctly. Reprogramming settings differently from how they'd been saved turned out to be one of Alphonse's more irritating quirks. Nothing too obvious or drastic - small things such as muting the master fader of a monitor mix or attenuating a mic pre a few dB from its last setting. The rehabilitation of Alphonse into a reliably consistent sound machine was gradual over the next four or five concerts though some features never returned. At no time did Alphonse's machinic independence compromise the performance. 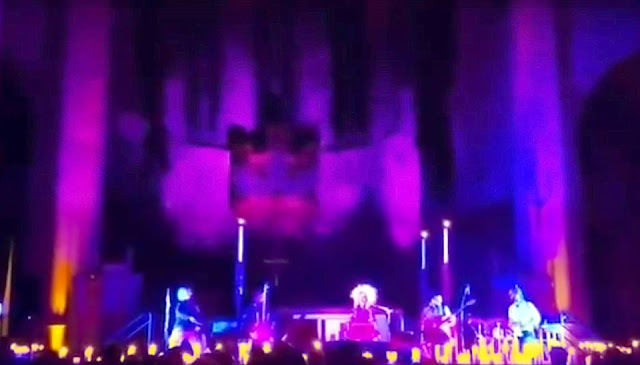 Except for the concert in San Francisco's massive Grace Cathedral where our PA was lost in the immensity of the space ... One could hear God laughing ...I was always happy with the Front of House sound and always got high on the music's invocation. Even in Grace Cathedral, a report came back from a music promoter sitting near front claiming it as the best sound he had ever heard there. Being as the tour began in Edmonton then went south to Calgary before turning west through British Columbia, my former stomping grounds for four years as a live touring soundman in the early 80's, I anticipated some kind of trip down memory lane. But it turns out that nostalgia ain't what it used to be. I love Canada and Canadians yet experienced no real connection to my former homeland. Except when traveling, my former human manifestation, my past life as it were, lived in Calgary from 1969 - 1983 and again from '85 - '87. Carlos Castenada talks about the spiritual warrior having no personal history. I felt so disconnected from my history in Calgary that the memories I do have of living there seem foreign, like they belong to someone else. The city hadn't changed as much as I had. More and more, personal identity seems like a con game blocking us from reaching our fullest potential. I'd been reflecting on the theme of "home" - see my last blog - so was expecting reminiscences of that type that never materialized. The second show in Calgary made me realize how important the performance space was to the event. It took place in a professional, technically tricked out theater in the heart of the city. Theater technicians helped us set-up and we even had union stage-hands helping to move equipment. Alphonse was plugged into a powerful sound system replete with righteous subwoofers. The lighting system was state-of-the-art.. This proved a sharp contrast from the new age community center in Edmonton though that venue was perfect for the opening performance - like starting a Broadway play at a smaller community theater to work out all the bugs in the performance before debuting on the Great White Way. SIMRIT shapeshifts with each different venue. The expression of their music is not completely determined by the musicians, but rather the assemblage of the band and the concert hall or theater. In Calgary, SIMRIT took full possession and owned that theater space. Beginning with an amazing opening set by cellist Shannon Hayden I experienced the presence of an high aesthetic, world class act taking all us listeners on an incredible musical voyage through a variety of moods and empirically transcendental spaces. Someone recently asked how I like touring and I replied that it becomes a combination of heaven and hell. During the concerts most semblance of personal identity dissolves with the remaining presence becoming intimately connected and linked to a dynamic musical process; part of the attention aware of the invocation with the rest of it placed upon the technical exigencies of mixing sound while staying alert to any signals from the stage. I attempt to remain faithful to the advice a friend once gave about paying attention to the invocation. Just because a high aesthetic force gets drawn down through you, it doesn't guarantee you'll be present to reap the benefit. The hell of touring comes from the constant traveling and the time demands of setting up and tearing down the production for every show. The best way to travel through hell, in this reporter's opinion, is with friends. Fortunately, everyone in SIMRIT's touring assemblage counts as a close friend; not in a superficial or sentimental sense, but in a philosophical and practical sense. Philosophy = philia + sophia - the love of wisdom. Philia is an ancient Greek word for a particular type of love commonly known as "brotherly love" (Philadelphia as the city of brotherly love, for example). In the Nicomachean Ethics Aristotle fleshes out the concept of philia as a dispassionate, virtuous love expressed as loyalty to friends, family, and community. Sophia means wisdom. In What Is Philosophy?, Deleuze and Guattari emphasize the importance of friends and their common love for wisdom in the creation and initial development of philosophy. But for Deleuze, friendship is also necessarily about friction, about being out of sync. ... The friction of uneven surfaces and the ensuing sparks are what cause the creative hum. There needs to be joy but also a kind of productive distrust. ... Stival notes how a Deleuze who has worked with Guattari seems to have discovered the necessity of the friend for thinking. Distress becomes important because it resists the sedimentation of thinking and being. True friendship is not about two individuals in an established relationship with each other but about pulling each other out of the self." I am fortunate and blessed to have many such friends to explore music with. Other tour highlights: driving through the awesome majesty of the Canadian Rockies, a morning drive and hike to an old ski jump site outside Revelstoke - daredevils, in days of yore, seeing how long they could fly without getting hurt. My mother's attendance at the Vancouver concert. She arrived at the load-in and stayed until load-out volunteering to pick up the pre-show meal. She was very animated after the show, blown away by the music, giving me an enthusiastic rundown of what she enjoyed about each musician and the group as a whole and saying that she didn't expect it to be as incredibly good as she experienced it. In this nihilist fin de siècle, he was affirmation. Right through to illness and death. Why did I speak of him in the past? He laughed, he is laughing, he is here. It's your sadness, idiot, he'd say. - Jean-Francois Lyotard on the death of Deleuze. Affirming death. Deleuze used to say that affirmation is not acceptance, but rather creation. If we create our reality in life, why not in death? You get immediate feedback from the audience as to whether the invocation succeeded, whether the force produced by the music in concert had strong affects to emotionally move everyone into some form of transcendental empiricism. Did they get high? After exiting the stage Simrit and Shannon would go out front to greet people as they were leaving and in the process get direct feedback on the evening's work, often extremely positive. People got "turned on" by the concert to use the 60's vernacular for an awakened state. Attempting to expand the forces and healing energy of the event outside of the local domain becomes the work of the theurgic practitioner. An effort is made to unite the microcosm of the concert space with the macrocosm of everything through a particular application of bhakti yoga. It's a chance operation, always an experiment, and you rarely get feedback of any effect that may or may not be occurring. Rarely, but not never. An unusual constellation of coincidences can suggest either results or the need for theurgic efforts. In other words, every once in awhile something lets you know you're on track, the resonance from the concert space is getting through. On Sept. 29th as the SIMRIT van was pulling up to an L.A. Whole Foods, a conversation spontaneously erupted about what a horrible place Las Vegas was with a few confirmed stories to that effect. I didn't join in because the only time I'd been there was amazing, a fond memory. I was mixing sound for Praxis. We were the first act on a bill that Tom Petty and the Heartbreakers headlined. Two of Petty's sound techs tuned the system before our soundcheck. That P.A. is one of the best I've ever mixed on; powerful, clean and clear. Another strong memory from Vegas was being at a stoplight on the strip and saying out loud a sudden realization that Tupac must have been shot near here. The driver informed us that we were at the exact spot where he died. Coincidences from a book I was reading started turning up. The setting for the book was Bob Dylan's tour with Tom Petty and the Heartbreakers. It mentioned him doing an annual benefit for a particular Jewish charity organization that an old friend of his was involved with. That charity turned up to be across the street from the Yoga West studio SIMRIT played on September 29th. I posted a blog on "home" then had the word home in the very next paragraph when I picked up that book. The Yoga West date wasn't a formal concert. It was an improvised performance supporting and underscoring a Kundalini workshop given by Jai Dev Singh Khalsa, Simrit's husband. Quite a special workshop to have a soundtrack like this. Shannon Hayden alternated between participating in the exercises and playing music. One fifteen minute passage of cello improv sounded both classical and of the future tapping into something otherworldly in mood. At one point, Jai Dev spoke of life and death in an unusual way: "when a child is born it exits through a door into this life and when they die they go through a door to the life beyond." It reminded me of an unusual comment E.J. Gold made years ago that what we call life, what we consider life to be, will seem like death when compared to the life the voyager has after leaving the body at the moment of death. He has repeated many times what he says is the common expression of the voyager right after leaving the body - "what was I doing in that thing?" “Akal…Deathless” introduces a very profound tradition in Kundalini Yoga. When a person has died, you chant “Akal” a minimum of three times. Akal means deathless and it helps to release the soul from attachment to the body, the earth and those it left behind. Simrit’s voice holds a world of power within it; she is an alchemist whose throat, with a simple akal, can take your spirit from grief to love. I often turn up Simrit's mic a fair amount when she's talking between songs because it's softer than when she sings. I had the mic gain at a healthy level when she leaned in and intoned "Akal" in a slow, powerful, tenor voice. In Golden Dawn magic they teach how to vibrate "God names" so that it's not only your voice but rather your whole body that vibrates with the name. This felt like that, to me. The whole theater was vibrating "Akal." Jared and Shannon started droning on their respective instruments underneath Simrit's intonation. Needless to say, it was an extremely intense space, one of the musicians later reporting that they were on the verge of tears. I've witnessed and participated in many forms of what you could call "prayers for the dead." This one stands out as one of the strongest and most moving - there was something very real there. Checked into the hotel late that night, this leg of the tour all said and done with the final show in Escondido. Turned on CNN - I monitor world events. It appeared very surrealistic. I didn't recognize the anchors who seemed a little stunned and confused and spoke with European accents. It didn't even seem like CNN, my conspiracy brain suggesting that the content was hacked and were just using the CNN logo. They were talking about a shooter in Las Vegas. They had very little information at that point airing lots of erratic cellphone footage. The fear and confusion of an unknown tragedy poured out of the television. I called my friend Rosa and told her what was happening. I stayed up as late as I could monitoring the situation. The full extent of the tragedy was discovered in the morning. I compared the timeline of events to find that Simrit gave the "Akal" death prayer chant about an hour before the tragedy in Las Vegas began. I find that synchronicity very interesting. Tom Petty had a full cardiac arrest that same morning, October 2, and left his body later that day. The only professional contact I had with him, albeit very tangential, was when Praxis shared a bill with him in Las Vegas. No idea what this means, if anything, maybe just freaky coincidences. "Akal." Affirming death. Going through the door. Countering tragic events - at least making the attempt. I am grateful for all the on-the-job training I've had for responding to death. It inevitably results in a greater appreciation and awareness for the preciousness of this life.